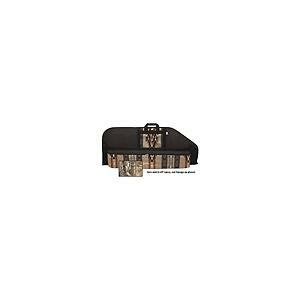 Case that fits most full-size crossbows with accessories. Features two outside pockets, one for bolts and one for small items, 1/2 inch foam padding with brushed Trico lining, and heavy duty YKK zipper with double pulls. Outside Diameter: 44 inchx 37 inch. Break Up camo. Full length double pulls zippers and 3/4in foam padding, a 10in x 6in zippered accessory pocket and 37in x 8 1/4in x 4in arrow box pocket make this a do it all stylish bow case. Revised 9/19/09 Catalog picture wrong, case is ALL camo. 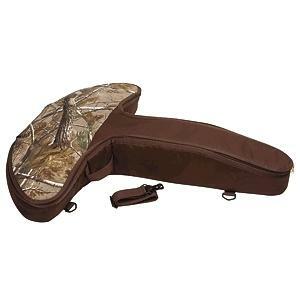 Crossbow case with 1/2in padding in the front and 3/4 inch padding in the stock and scope area. It has trico lining and a removable shoulder strap. Measures 41 inch x 32 inch and fits most crossbows. 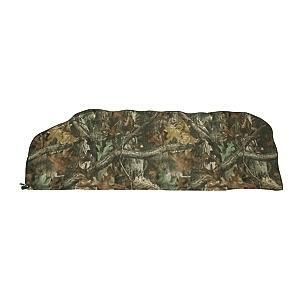 A lightweight poly-cotton camo bow case designed to meet all case law requirements. Folds to pocket size. 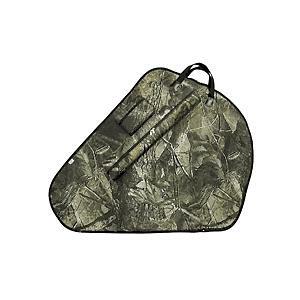 Large enough to case hunting bow with quiver and arrows attached. Full length nylon coil zipper. 53 inch x 19 inch. PACKAGE INFO: 1 each.